A dramatic wedge-shaped presence on an otherwise banal suburban street, the Critchley-Waring residence at 12 Eastview Crescent shows the influence of the so-called Harvard Five, a group of pioneering Modernist architects that settled in New Canaan, Connecticut during the late 1940s. Former Bauhaus instructor Marcel Breuer and his Harvard students John M. Johansen, Landis Gores, Philip Johnson and Eliot Noyes brought Modernism to the upscale Manhattan commuter suburbs, designing dozens of iconoclastic houses for adventuresome clients. A property developer recently arrived from England, Angus Critchley-Waring was just such a client. He commissioned architect George Eber of John B. Parkin Associates to design his family home in the Breueresque mode, with clean, crisp lines and a sharply-sloped monocline roof. The two-storey west wing houses the bedrooms atop the garage and a recreation room, which opens onto a ground-level patio and gardens. But the real drama was reserved for the main-floor living areas: once past the entrance gallery, visitors were treated to what was then a stunning view of the ravine to the north through a glass wall that stretches some 12 feet from the floor to the ceiling peak. Space flows freely through the open-plan living room, dining room and study, with their terrazzo floors, storage walls of black walnut and massive fieldstone fireplaces. By contrast, the front of the house is largely blank and private; the glass-walled entrance allows southern light to penetrate into the living areas and balance the flood of light from the north. Exteriors are of smooth buff-coloured brick and natural cedar siding, now painted over, and accented by linear zips of white trim. 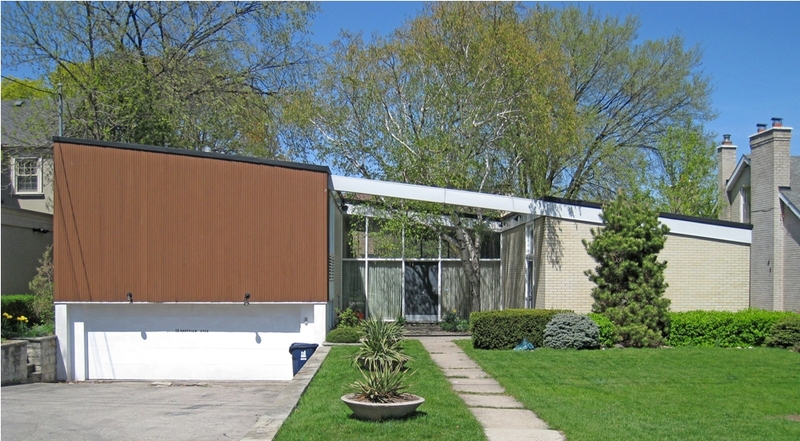 The Critchley-Waring house was a finalist in the 1961 Massey Medals for Architecture competition and is still in original condition, down to the saucer-shaped planters lining the front walk. George Eber (1923-1995) was born in Budapest, Hungary and arrived in Canada in 1950. He rose rapidly through the ranks at John B. Parkin Associates, becoming production head of design and, by 1961, manager of the firm’s Montreal office. After establishing his own Montreal practice, Eber designed the Jamaican pavilion for Expo 67 and was the associate architect for several others, including Buckminster Fuller’s famous geodesic-domed pavilion for the United States. Other significant projects include the Montreal Aquarium and the Hunter Douglas offices and plant in Pointe-Claire. Pinball Games: Arts of Survival in the Nazi and Communist Eras, Eber’s harrowing account of his life during the Second World War and behind the postwar Iron Curtain, was published in 2010. Angus Critchley-Waring is probably best remembered for developing the long-lost Lothian Mews at 96 Bloor Street West, an intimate ring of shops and offices around a fountain and courtyard that became a focal point for Toronto’s Yorkville cultural scene during the 1960s and 70s. Toronto Modern? Awesome idea for a blog! All the entries so far have been great, keep up the good work! Hi – thanks for the kudos – glad you enjoy the blog! I worked for George. I just so happen to have the original architectural drawing of this house. It actually won an award.